Augmented Reality (AR) is emerging as one of the key drivers of the tech economy. By some estimates, the total value of the AR market is expected to reach $100 billion by 2020. That’s because AR apps, headsets, and smart glasses hold the promise to add value to virtually every industry – from retail to industrial manufacturing. AR is already showing potential to solve some of the biggest problems and pain points, and we likely won’t have to wait until 2020 for AR to make a big impact across the board. From operating MRI equipment to performing complex surgeries, AR tech holds the potential to boost the depth and effectiveness of medical training in many areas. Students at the Cleveland Clinic at Case Western Reserve University, for example, will now learn anatomy utilizing an AR headset allowing them to delve into the human body in an interactive 3D format. In today’s physical retail environment, shoppers are using their smartphones more than ever to compare prices or look up additional information on products they’re browsing. World famous motorcycle brand Harley Davidson is one great instance of a brand making the most of this trend, by developing an an AR app that shoppers can use in-store. Users can view a motorcycle they might be interesting in buying in the showroom, and customize it using the app to see which colors and features they might like. One of the biggest industrial use cases of AR is for repair and maintenance of complex equipment. Whether it’s a car motor or an MRI machine, repair and maintenance staff are beginning to use AR headsets and glasses while they perform their jobs to provide them with useful information on the spot, suggest potential fixes, and point out potential trouble areas. This use case will only continue to get stronger as machine-to-machine IoT technology grows and can feed information directly to AR headsets. From interior design to architecture and construction, AR is helping professionals visualize their final products during the creative process. Use of headsets enables architects, engineers, and design professionals step directly into their buildings and spaces to see how their designs might look, and even make virtual on the spot changes. Urban planners can even model how entire city layouts might look using AR headset visualization. Any design or modeling jobs that involve spatial relationships are a perfect use case for AR tech. AR presents a variety of opportunities to increase efficiency and cost savings across many areas of business logistics. This includes transportation, warehousing, and route-optimization. Shipping company DHL has already implemented smart AR glasses in some of its warehouses, where lenses display to workers the shortest route within a warehouse to locate and pick a certain item that needs to be shipping. Providing workers with more efficient ways to go about their job is one of the best ROI use cases in today’s business environment. Technology has gone a long way towards advancing the tourism industry in recent years, from review sites like TripAdvisor to informative website like Lonely Planet. But AR presents a huge opportunity for travel brands and agents to give potential tourists an even more immersive experience before they travel. Imagine taking a virtual “Walkabout” Australia before on AR glasses before booking a ticket to Sydney, or a leisurely stroll around Paris to see what museums or cafes you might like to visit. AR promises to make selling trips, travel, and vacations a whole lot easier in the future. While technology like tablets have become widespread in many schools and classrooms, teachers and educators are now ramping up student’s learning experience with AR. The Aurasma app, for example, is already being used in classrooms so that students can view their classes via a smartphone or tablet for a more rich learning environment. Students learning about astronomy might see a full map of the solar system, or those in a music class might be able to see musical notes in real time as they learn to play an instrument. Whether it’s something as small as an air conditioner, or as large as a wind turbine, every day field service technicians get dispatched to repair a piece of mission critical equipment that needs to get up and running as soon as possible. Today, these technicians can arrive on-site with AR glasses or headsets and view whatever they’re repairing to more quickly diagnose – and fix – the problem. And instead of having to thumb through a repair manual, technicians can go about their business hands-free to get in and out faster than ever. In the entertainment industry, it’s all about building a strong relationship with your branded characters and the audience. Properties like Harry Potter are immensely successful because readers of the books and watchers of the movies feel like they know the characters, and are hungry for additional content. Entertainment brands are now seeing AR as a great marketing opportunity to build deeper bonds between their characters and audience. As a matter of fact, the makers of AR sensation Pokemon Go are soon planning to release a Harry Potter-themed AR game that fans can interact with day in and day out. In the event of an emergency today, people will immediately reach for their smartphone to find out what’s going on, where to go, and whether their loved ones are safe. Moreover, first responders arrive on the scene of a fire or earthquake trying to figure out who needs help, and the best way to get them to safety. AR is showing promise in solving both pieces of the public safety puzzle. First responders wearing AR glasses can be alerted to danger areas, and show in real-time individuals that need assistance while enabling to still be aware of their surroundings. For those in need, geolocation enabled AR can show them directions, and the best route to, safe zones and areas with firefighters or medics. How do I improve concentration and increase my productivity? originally appeared on Quora: the place to gain and share knowledge, empowering people to learn from others and better understand the world. Our attention is scattered. We know we need to find time to meditate, workout, eat right, focus on our goals–but we can’t seem to do it. All of those tasks require concentration. And sadly, many of us are unable to focus enough to follow through with them. A constant barrage of notifications, pings, and tidbits of information has decimated our attention spans. A friend, mentor, neurologist, and drug developer, Steve Peroutka, used to give a presentation entitled “Portion Distortion.” His central thesis was that the caloric density in U.S. food has become extraordinarily high over the past several decades, with no signs of abating. Steve said that unless you are actively and purposefully trying lose weight, by default, you will gain weight. This is leading to the country’s obesity epidemic. We’re at the same point with our attention and focus. If you’re not actively and purposefully taking control of your attention, by default, you’re in a constant state of distraction. So, how do you achieve the level of focus necessary to lose weight, to eat right, or just to focus on the important tasks in your day-to-day life? When all is said and done about meditation for most of us, a hell of a lot more is said than done. You want to put yourself in situations where you have no choice but to focus, just to merely endure what’s at hand. I find it easier to train your mind through your body, rather than the other way around. For example, try going for a run and pushing yourself to a level that’s above a jog but less than a sprint. You are trying to achieve a point that feels strenuous but that you can endure for extended periods of time with focus. I like to do this because this type of running requires mental focus. You can’t chat with the runner next to you or solve complex problems. It takes all your focus to merely maintain the pace. It works the same way for cold showers. If you’re willing to try it (I’ll admit, no one ever is), you’ll immediately notice that staying in the shower for even a few minutes requires tremendous focus on the present situation. Your mind is not going to wander. It takes your all to stay in this physical condition. Your physical limits can develop your mental limits. But this isn’t the way we normally think of things. Instead, many of us spend all day instantly responding to notifications on our phones or computers. This is essentially practicing distraction. To get better at focusing, put yourself in a situation where success depends on your ability to concentrate–over and over again. You can do this mentally by training yourself to remain at the edge of your problem-solving abilities for an extended period of time. Think about how much work you can get done in your head over the course of the day. Truthfully, you can probably do more. By training your mind and building up your capacity for memorization, you can increase your ability to get things done in your head. And when you do, you can accomplish and focus on much more than you originally thought possible. You can use moments of free time to work on problems. 1. Decide you will work on the problem at some point in the future. 2. Memorize all the facts, anecdotes, and knowledge you need to work on it. You have to fully internalize all the material, and place it in your working memory. 3. Practice manipulating that knowledge in your mind to achieve different outcomes. 4. Take the results of that manipulation–the work you did on the problem–and commit them to memory. That way you can retrieve them later when you’re near a computer or at a meeting. I know it sounds complicated, but it really isn’t. It just requires some practice. And you benefit by developing your ability to focus while simultaneously solving complex problems. All of this won’t matter unless you monitor your environment. Your environment is always subtly nudging you in some manner. If you use big bowls, you’re going to eat more. If your phone is within reach (or even visible), your attention threshold is decreased. Take advantage of your environment or suffer because of it. When you’re surrounded by distracting environmental cues, you amplify your problems. That’s why it’s imperative you create an environment that works for you. Keep anything that provides continual, intermittent notifications to a minimum. My recommendation is to avoid a smartphone-connected digital watch like the plague. I’m always an early technology adopter, but I forced myself to do without this one thing. I knew I’d instantly be addicted to the notifications, and it would destroy my attention span. Unfortunately, it’s not just about digital watches–any electronic gadget can hurt your ability to concentrate. In fact, just about all of them do. When we moved into our new house a year and a half ago, I made sure the third floor was free of all electronics. It’s set up like a library, and it has a table that doubles as a whiteboard. I tell my kids if they want to push their intellectual limits to the max, they should go to the third floor. Happily, they’ve gotten the message. That’s where they go if they want to get something done quickly. Nothing electronic with a screen has ever been on our 3rd floor. Getting better at anything requires a concerted effort. If you find even a small amount of time during the day to put yourself into situations that require focus and concentration, you’ll see the results amplify over time. TORONTO (Reuters) – Bank of Montreal (BMO.TO) and Canadian Imperial Bank of Commerce (CM.TO) said on Monday that cyber attackers may have stolen the data of nearly 90,000 customers in what appeared to be the first significant assault on financial institutions in the country. Bank of Montreal (BMO.TO), Canada’s fourth biggest lender, said on Monday it was contacted by fraudsters on Sunday who claimed they were in possession of the personal and financial information of a limited number of the bank’s customers. A spokesman for the bank said it believed that less than 50,000 of the bank’s 8 million customers across Canada were hacked. He declined to say if any customers lost money as a result of the attack. Canadian Imperial Bank of Commerce (CM.TO), Canada’s fifth biggest lender, said fraudsters contacted the lender on Sunday claiming they had electronically stolen personal and account information of 40,000 customers of its Simplii direct banking brand. Other Canadian banks said they had not been affected. Shares in BMO were down 0.3 percent and CIBC was off 0.3 percent. Canada’s six biggest banks have been collaborating along with the Bank of Canada to enhance their defenses against cyber attacks. The Bank of Canada said earlier this month that some attacks would inevitably succeed but it has recovery mechanisms in place to limit the damage. Alibaba’s (BABA) Ant Financial plans to raise fresh funds at a valuation of $150 billion, but it faces a number of headwinds. Alibaba recently suffered a setback when Walmart (WMT) dropped Alipay from all its stores in Western China. This step could be followed by a nationwide rollout in which all the Walmart stores in China accept only Tencent’s Tenpay. Walmart has 443 stores in China which include 406 Supercenters, 18 Hypermarkets, and 19 Sam’s Clubs. Both Walmart and Tencent have a big stake in JD.com (JD), which is Alibaba’s biggest competitor in China. As the Chinese retail ecosystem is being fought over by Alibaba and Tencent, both big and small retailers have had to choose between either of the two goliaths. Tencent has some major advantages in this market which it is using to increase its market share. According to a recent disclosure, Ant Financial Services group’s wealth management business has Rmb 2.2 trillion or $385 billion of assets under management. It has 600 million users. This makes it the biggest customer wealth management platform in the world. There are other financial products which can be introduced by Alibaba to maximize the potential of its payments ecosystem. If Alibaba is able to retain its market share in this very important segment, we should see huge upside potential for the entire platform and the stock. 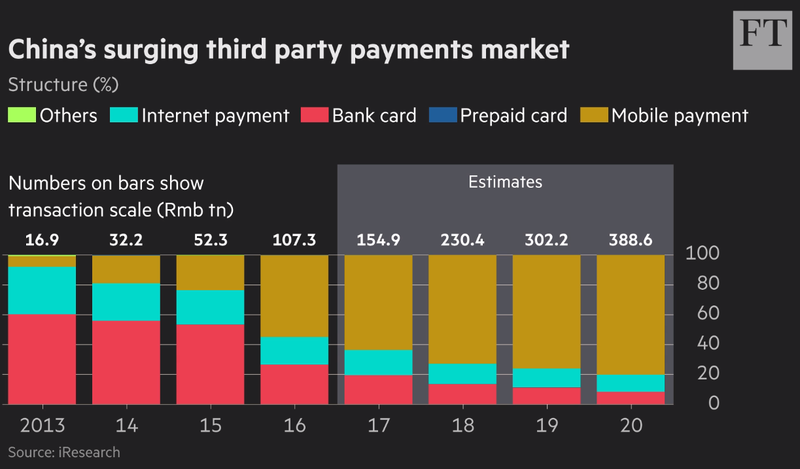 Tencent was quite late in entering the payments market. Alibaba’s Alipay has been used since 2004. By early 2014, Alipay had a 70% market share in China’s online payment market. But this has changed significantly in the past few years. Recent estimates by Beijing-based consultancy iResearch show that Alipay has 53% market share where Tenpay is close on its heels with 40% share. The stakes for both Alibaba and Tencent are quite high. China is seeing a rapid increase in transaction volume through mobile payment as customers move away from bank cards and other payment options. This means that over the next three years, we will not only see a doubling of total transaction volume but also a much higher share of mobile payments within the overall pie. Both the companies have realized the importance of this segment and are going full throttle in their expansion initiatives. Alibaba is at a minor disadvantage in this battle because all its competitors are moving under Tencent’s banner. Hence, even though Alibaba has a greater market share and a good growth runway due to its rapidly growing retail operations, it still needs to compete against a growing list of retailers that have started using Tenpay. Tencent also has other advantages besides the fact that it is the only company which can challenge Alibaba. As the urban market gets saturated by payment options, both Alibaba and Tencent have started moving into rural areas. In these areas, Tencent already has a big customer base due to its WeChat application. Most of the potential customers for Tenpay would have already used WeChat and hence using the payment platform is a mere extension of the core app. On the other hand, the use of Alibaba’s e-commerce platform is not as widespread in rural parts as it is in urban areas. The payments market is just the beginning for Alibaba and Tencent. As they get greater customer data, they will be able to gauge the creditworthiness of a customer and provide tailor-made financial products using data mining. This can extend from loans and insurance to more exotic products. All these segments have much higher margins and significant growth potential within China. It must be noted that most of the customers in China skipped the entire credit card growth phase and have now settled with Alipay and Tenpay. Alibaba formed Yu’e Bao in 2013 to manage the leftover cash from spending on its e-commerce platform. By 2017, this money market fund had amassed $165.6 billion under management. This number is now closer to $385 billion according to recent disclosure by the company. The rapid growth of this fund shows the future potential of Alibaba’s financial division and the innovative financial products it can bring to the market. The future growth in these products will closely follow the market share of Alibaba and Tencent within the payments ecosystem. Hence, it has become extremely important for Alibaba to defend its turf and build a strong moat. 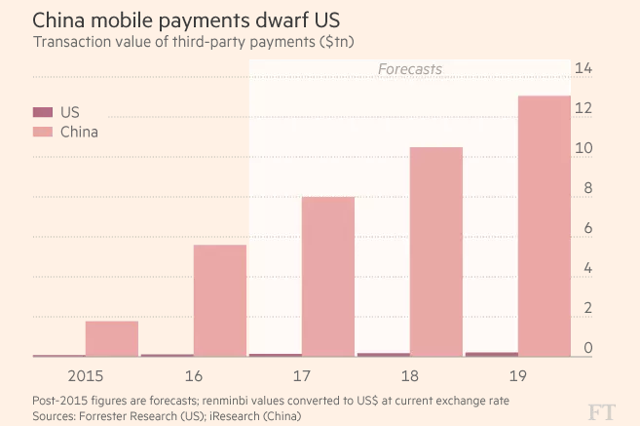 The payments battle is not limited to China but extends in almost every part of the world. For example, Alibaba has a huge stake in Paytm which is the biggest payments player in India. This company has seen rapid growth in the last 30 months. It is highly possible that Alibaba is able to gain a decent footprint in the payments ecosystem of developed markets over the next few years. In order to avoid regulatory pushbacks, Alibaba is more likely to invest in unicorns and promising startups in developed countries instead of growing its own platform. A similar approach in India has allowed Alibaba gain a strong foothold through investments in Paytm and online grocer Big Basket. What to expect in the next few quarters? Alibaba’s “New Retail” initiative was a response to the expansion of Tencent/JD within offline retail. Alibaba has already made some big-ticket investments in brick and mortar stores. These include $2.9 billion investment in Sun Art, $2.6 billion in InTime and $4.6 billion in electronics retailer Suning. In February, Alibaba made RMB 5.45 billion or $867 million investment in Easyhome Furnishing for 15 percent stake. This pace of investments should continue for the next few quarters. Some of these are defensive purchases which are made to prevent future acquisition by Tencent. We should also see a negative impact on the margins as more incentives are given to customers to lure them. When Tencent announced its recent earnings it mentioned that the company would “aggressively” invest in video and payment, which may hurt margins. This warning was enough to send the stock sliding down by 4.6% even though the net profit beat estimates. A similar trend is possible within Alibaba which can lead to lower margins, even if the revenue growth is high. Alibaba also needs to make bigger investments in digital segment because it does not have a core social app like Tencent which can retain customers within its ecosystem. Alibaba has a decent lead over Tencent in the payments market. 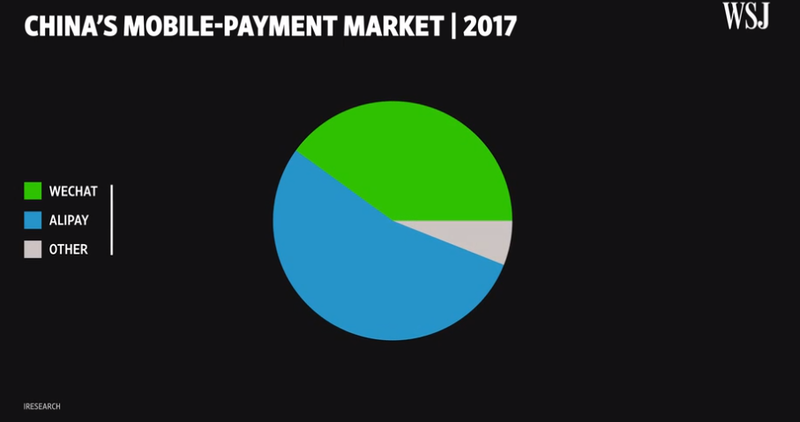 Also, Alibaba’s market share in payments is closely following the market share of the company within e-commerce. The penetration level of financial products in China is still quite low compared to U.S. and Western Europe. Alibaba can use its ecosystem to attract customers to new financial products and also use its market leadership to build a better moat against rivals. Although we could see some margin contraction in the next few quarters, the long-term growth story for Alibaba is intact. Alibaba is a good buy-and-hold option for investors with long-term horizon. No, these aren’t words from your mom, your aunt, or even your elementary school teacher. These small but practical bits of advice came from Oprah Winfrey, philanthropist, billionaire, and American media mogul, who delivered the commencement address for a lucky group of graduates this month. 1. Be so good they can’t ignore you. “The number one lesson that I can offer you where your work is concerned is this: become so skilled, so vigilant, so flat-out fantastic at what you do that your talent cannot be dismissed.” Make yourself indispensable and see what heights you can reach! 2. Pick a problem and work to solve it. Two things you should know about me before you read this. 1. I absolutely believe in free speech. The government should never, ever punish anyone for voicing their opinion. You should be able to say whatever you want–even if it’s absolutely horrible–without fear of government reprisal. I will support you 100 percent in your quest to make a speech, hold a march, or even burn a flag. 2. I don’t care one whit about football and the NFL. I find government subsidies of football stadiums to be a horrendous thing and would never, ever vote in favor of such a subsidy. I find the NFL’s treatment of cheerleaders to border on criminal, and I don’t think they do enough to prevent brain injury. Would I say I have a positive view of the NFL? Absolutely not. That out of the way, I support the NFL in their rule banning kneeling on the field during the National Anthem. Why? Because the players are at work. For some reason, we seem to have this idea that we get to retain all our individuality when we go into the job. Maybe this comes with the idea of “bringing your whole self” which has kind of turned Google into a mess. I’m not sure. Additionally, we don’t really see NFL football players as employees–they are athletes. Athletes who have a job. We don’t say, “Jim isn’t an employee–he’s a CPA!” Yeah, he can be both, and most likely is. Football players aren’t at-will employees (like almost all of us in the United States), as they do have contracts. But, that doesn’t make the NFL completely impotent in their ability to enforce workplace rules. You certainly have more rights off the clock than on, but even those aren’t completely absolute. [H]e…has the constitutional right to peacefully express those opinions, no matter how vehemently one might disagree with his point of view. Those rights are what make America great. Those constitutional rights, however, stop at a private employer’s door. And I, as a private employer, have the right to hold my employees accountable for their viewpoints and terminate when I, in good faith, determine that those viewpoints may bleed into my workplace and create a hostile environment for other employees. I certainly have the right to fire when those viewpoints cross the line into violence or threats of violence. They can set workplace rules and this one is quite reasonable. You either stand and show respect during the National Anthem or you stay in the locker room (or a similar area off the field). Last year’s protests were absolutely disruptive. The NFL lost viewership last year, and 50 percent of those who watched less football in 2017 did so because of the kneeling protests. If you had such a strong source for a loss of clients, you would strongly think about changing your rules. Lots of people question why the NFL has taken such a hard line on this when they seem to ignore the bad off the field behavior of their players. It’s an excellent question and one we should continue to ask the NFL. Of course, there are two key differences: one is that they aren’t being utterly horrible at work. The other is that you can’t, legally, discriminate against employees purely on the basis of a conviction. You have to show that it’s related to the work at hand. While you can certainly argue that violence of any kind never belongs in any workplace and that should be an exclusion for work in the NFL, they haven’t made that argument. Overall, the NFL is desperately trying to regain their viewership, and this is one step along that route. I absolutely support their right to enforce this rule. Now, will it work or will it backfire? It’s hard to tell before the season begins. It will definitely be worth watching, even if the I don’t find the football itself interesting. 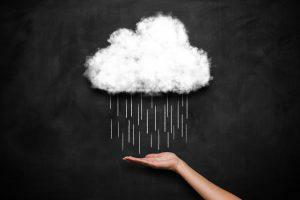 What can Amazon teach us about how to use the cloud? When I first heard Werner Vogels, Amazon’s CTO, talk about building the the cloud, he mentioned how it was a thorny process involving lots of “undifferentiated heavy lifting.” The journey to create Amazon Web Services involved workarounds for failures in the Border Gateway Protocol, addressing problems of jittery networks, and solving a vexing stream engineering problems that eventually led to the explosion of cloud services that Amazon offers today. At the time, I realized that while it would be great if Vogels or Andy Jassy, CEO of AWS, wrote a book about how the cloud was built, it really wouldn’t be that useful for people using the cloud. The book that would be helpful for the thousands of companies now trying to use the cloud would be one that captured the lessons from people who have been using AWS to solve business problems and accelerate the pace of innovation. That’s the book that Stephen Orban, General Manager at AWS, has just written called Ahead in the Cloud: Best Practices for Navigating the Future of Enterprise IT. Orban, who previously built and led the Enterprise Strategy function at AWS, has been working on Ahead In the Cloud for several years, mostly by writing articles and blogs that capture knowledge about how to address dozens of issues that arise when an organization moves to the cloud. While you will find some discussion of technology, mostly what Orban covers is a broad patchwork of ideas that he and his coauthors have distilled from experience. Forbes Technology Council Elite CIOs, CTOs & execs offer firsthand insights on tech & business. Opinions expressed by Forbes Contributors are their own. Earlier this year, news broke that Cambridge Analytica had illegally obtained and used Facebook profile data from millions of users for political purposes. Although the UK-based data firm will be shutting down and filing for bankruptcy, the troubles related to this scandal are far from over: Consumers are now wary of the way companies like Facebook are handling their data, and businesses must work extra hard to demonstrate a commitment to data security and privacy. We asked a panel of Forbes Technology Council members how they’re talking to their customers about data safety. Here’s what they had to say.